For the entire night after I saw A Quiet Place I thought every sound was too loud. I put something down and the noise it made stood out to me. Each footstep seemed to fall heavier than it should have. Opening a door was a creaking disaster in staying silent. I know I wasn't the only one feeling this either. I've never left a movie theater with the crowd whispering like they might be killed if they spoke any louder. A Quiet Place is the best kind of horror. The kind that sticks with you past the jump scare. That makes you think beyond the blood. The kind that builds tension over horror, and then delivers both perfectly. It may also convince you to never have children. A Quiet Place has a pretty simple setup that it doesn't really care about explaining, nor does it need to. At some point monsters/aliens/things took over the earth and killed almost everyone. These creatures have no eyes, and hunt solely through sound, thus making too much noise is a death sentence. We're plopped down into this world in media res as the Abbott family is quietly surviving in their rural home in the middle of nowhere, unable to contact the outside world -- if there is any outside world left. More than a year into the start of the attacks Lee (John Kransinki) and Evelyn (Emily Blunt) have built a very silent life with their three children: Marchus (Noah Jupe), Regan (Millicent Simmonds), and Beau (Cade Woodward). That is until tragedy strikes, and things really start to spiral out of control as a new baby comes along. What is most notable about the film is its commitment to its theme. Lesser films of this ilk would keep the ever present silence as an opening gimmick, possibly laying it on too thickly for the first quarter of the film before devolving into something less. 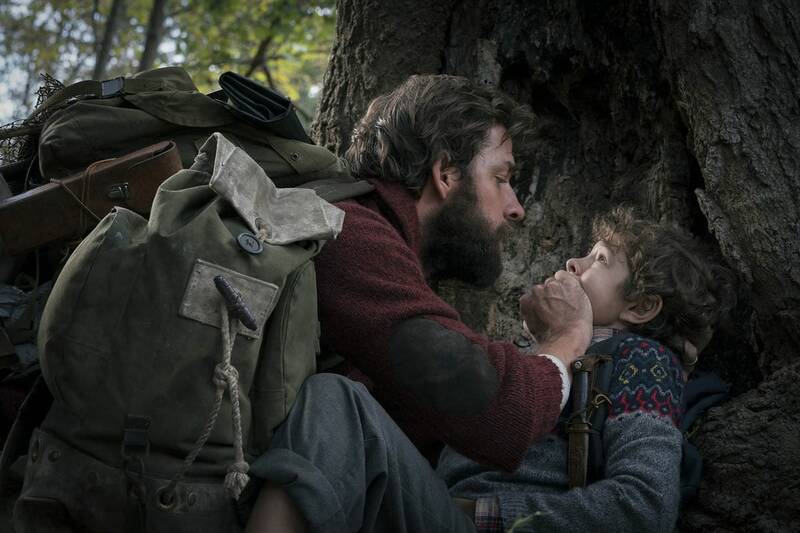 A Quiet Place never leaves its trick behind, instead milking it for all its worth, and building tension upon tension. To this end, the slightest noise becomes unnerving, and louder scenes become absolutely catastrophic to your senses. But the silence never feels like a gimmick. Krasinski doesn't use it in cheap ways -- for instance a minimal score comes in and out instead of forcing the film to function without one at all. It's also, smartly, not about the monsters at all. A Quiet Place is about this family, who just happens to be in a really terrible situation.The film never breaks away from them. There's no world outside of theirs. The layers of nuanced relationships affect and grow in monumental ways that open up the film to more than just scary monster beats. I'm trying to talk around some spoilers that happen pretty early on here, but suffice to say not everything goes how you would think. What this all ends up meaning is that the film is tenser and scarier because you actually care about the characters. While there's always a time and place for movies where a collection of stupid teenagers are butchered by a dude with machete, the suspense ramps up astronomically when you aren't actively cheering for the characters to die. This focus on family over monsters not only makes the film scarier, but it also solves one of horror movies biggest issues: kids are idiots and they will get you killed 100 percent of the time. In most horror movies when the kid runs off to do something stupid it is spectacularly grown worthy, with little or no motivation other than they're a kid. Because of the A Quiet Place's focus on the family's dynamics when the kids are idiots in it you understand. They are the actual actions of a troubled, scared, and frightened child extrapolated into a situation where any noise they make could kill them. For Krasinski as a director this is a pretty bold statement that we should take him more seriously. Making a movie like this takes some serious commitment and talent, and he handles it fantastically. He's not afraid to keep the film simple, and even more surprisingly does better than 90 percent of horror directors out there in pacing the reveal of his monsters. Blunt helps him in spades by delivering a performance that pulls you to the edge of your seat for a solid 15 minutes of child birthing terror. The film as a whole is definitely a better outing than Krasinski's first directing effort, The Hollars, which was basically as good as you remember it being... and you don't remember it all. At the end of the year I could easily see the film coming up for some of the more audio related Oscar nominations as its sound design, score, and sound editing are that on point. Two of those three things I almost never mention in a review so that should tell you how important sound is to this movie, and just how well Krasinski incorporates it. It makes for great horror, great drama, and a movie experience you're not going to get very often.